Starting in 2006, NASA started a new set of programs to develop launchers and capsules and to provide cargo and crew services to the International Space Station (ISS). The first of these programs was called "COTS" standing for Commercial Orbital Transportation Services. The usual approach for NASA to procure things was through a "cost-plus" approach in which contractors estimated costs and, if there were cost overruns, NASA would pay for them and the company's profit would be determined as a portion of the final costs. Naturally, there wasn't a lot of incentive to keep costs down. Also, there was a lot of NASA oversight and regulation thereby adding to the costs. But the COTS program use the "fixed-cost" approach in which, if there were cost overruns, NASA wouldn't pay any more but the companies would "eat the costs". Along the way there were payments as milestones were achieved. This incentivized the companies to make progress rapidly while keeping costs down. The results? A NASA study showed that the development of the Falcon 9 using the COTS approach ended up costing about 1/8th the cost than had it been done under the cost-plus approach. The COTS approach should be repeated as we return to the Moon. 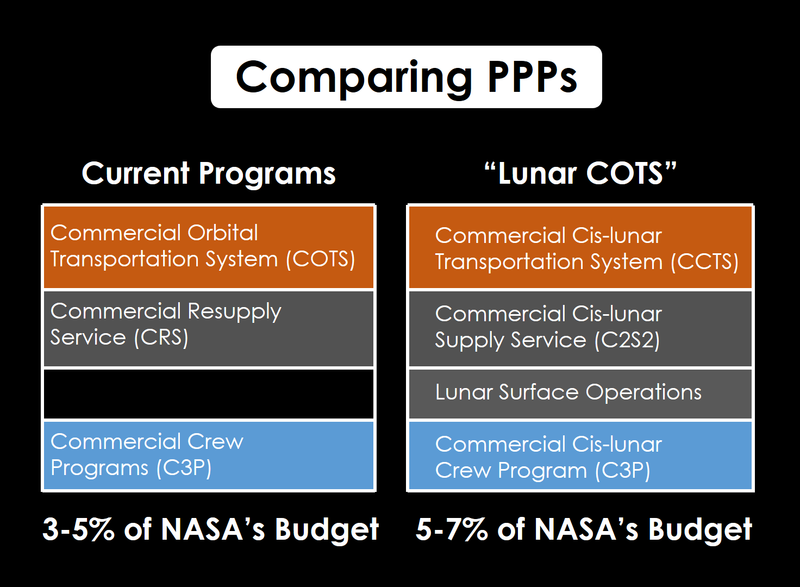 The current, large public-private programs consume only about 5% of NASA's budget. Yet, for this small amount we are getting access to two rockets, two and a half capsules, cargo deliveries to the ISS, and soon crew deliveries to the ISS. Also, as an added bonus because SpaceX was one of the participants, we are also getting access to partially-reusable rockets and the Falcon Heavy. Not bad for 5% of the budget. The Plan for Sustainable Space Development describes a set of public-private programs very similar to those used to establish commercial access to the ISS. There is a one-to-one correlation between the transportation hardware development and cargo & crew delivery services. The one difference is that the "Lunar COTS" programs will include lunar surface operations including the extraction of resources (ice) of which there is no ISS equivalent. 2 years - Terresterial Demonstrator of a full-scale lunar lander. 6 years - Development of the ice-harvesting telerobots. 6 years - Development of a lanch-ready lunar lander. 8 years - Selection and training of the first permanent crew. 8 years - Arrival of the first crew at a permanent lunar habitat. 9 years - Arrival of a series of international lunar exploration teams. 11 years - First arrivals of private individuals at an expanding lunar base / settlement. The flyby and Phobos-Deimos Mars missions would occur during this timeframe. Commercial space is a very popular concept right now. Whereas the Obama administration was very supportive of commercial space, it was entirely against the concept of American crew leading the way to the Moon. The only lunar programs to make it through Obama's NASA are some small scale programs including seeking information about commercial lunar landers only big enough for small science packages. Just because these small programs are commercial doesn't mean that they are any substitute for the full-size program and landers envisioned by Lunar COTS. We need Lunar COTS. It won't happen without specific effort to establish it. Secondly, the other "lunar" program left over from the Obama administration are the steps to establish a "Deep Space Gateway" which would be a mini-Station in a type of lunar orbit. The argument is that such a station could help us learn how to conduct long-duration missions to Mars in deep space and that it could somehow help international or commercial entities in their efforts to go to the Moon. No previous NASA lunar program concept envisioned the need for a station in lunar orbit as necessary to get to the Moon. 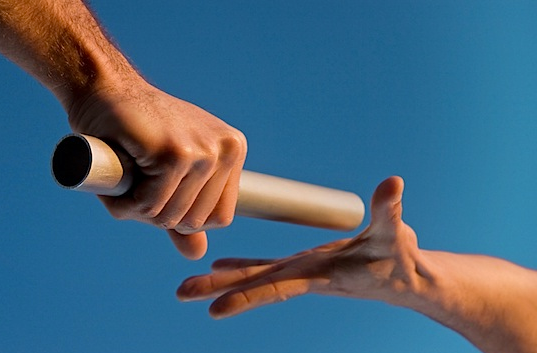 Indeed, such a concept is like a relay race where, instead of the first runner handing a baton to the second runner, a middle man is place between them whose only job is to collect batons from the first runners only to hand them off to the latter runners. Far better to eliminate the middle man. 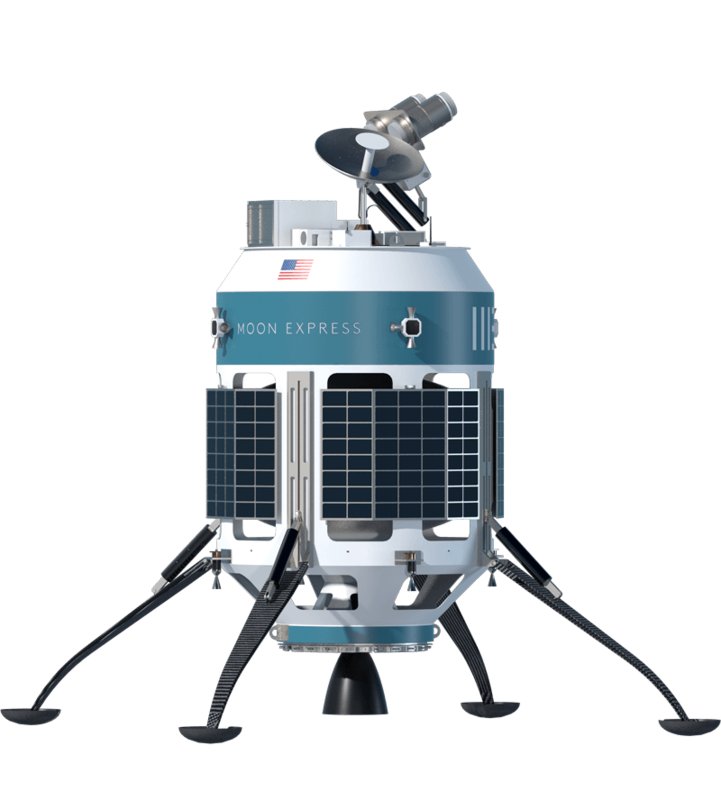 So, cargo and crew modules should be handed directly from the vehicle coming from the Moon to the refueled lunar landers -- no middle man needed! NASA's budget is hobbled big time by ongoing programs costing billions each year including the ISS, the SLS, and the Orion capsule. If a Deep Space Gateway were added requiring SLS launches to rotate irradiated crew from the DSG, how much money will be left over for lunar development or Martian missions. There is a real danger that we will get stuck in lunar orbit without enough funds to do much else.